I received this book from TLC Book Tours for my review. 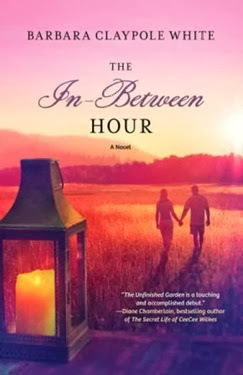 The In-Between Hour is the second novel by Barbara Claypole White and was a beautiful story of two families, each damaged in various ways, coming together and helping one another survive. All of the characters in this book had a connection to mental illness. Will’s mother, although never diagnosed, most likely was bipolar. Hannah’s father suffered from depression, and now she has to face that her son most Galen likely inherited this depression. While Galen turns to Will as a trustworthy adult, Will has a difficult time being there for him due to the recent loss of his own son, Freddie. Meanwhile, Will’s father is aging and needs more care than Will can provide himself. Hannah and her best friend Poppy become close to Will’s father. As Will’s family and Hannah’s family intertwine, Will and Hannah find themselves attracted to one another. But they both have a hard time letting love in. This was a sweet story with many components – aside from those mentioned above there was an animal and nature theme as well as a lot about the Occaneechi Native American tribe, both of which contributed to the story. I was very impressed with the author’s ability to make her characters as well as the setting come alive and become meaningful to the reader. This is the kind of novel which stays with the reader even after closing the book. If you would like to win a copy of this book, just leave me a comment! The new year is upon us and has brought in a cold front of epic proportions! Don’t miss your chance to receive 15% off Select Throw Blankets at Zinc Door, 1/15-2/14, with promo code BLANKETS. With these savings, you can keep your body warm and your pockets lined. Be sure to check out Zinc Door today and take advantage of these great discounts!